Just think how different our lives will be a year from now. When we pick up the phone, it might be a friend or family member, rather than a political pollster. When we get our mail in the afternoon, it will be significantly lighter because we no longer will be getting flyers from the candidates. When we watch the 10:00 news, the commercials might actually be for goods and services rather than a series of candidates smiling to the crowds, shaking hands and kissing babies and telling us how great life will be if they get elected. Yes, a year from now, the election will be over, we’ll have a new president elect and we can get back to normal for a couple years before it starts again. By no means would I consider myself a political junkie. Sure, I’ll caucus and I’ll vote, and maybe watch a debate or two, but it is highly unlikely you’ll ever see me marching in a parade, knocking on doors or even putting a sign in my yard. It is even more unlikely that I’d ever consider running for public office. Regardless of my personal involvement, I’m fascinated by the political process for many reasons. Subject to a few restrictions, almost anyone can put their name on a ballot for something. The current crop of Presidential candidates offers a decent representation of our national population, with both men and women from various races, religions and backgrounds all currently in contention. At the local level you can find lawyers, farmers, and teachers, to name a few, all working together on city councils, school boards and congress. Political participation is no longer for an exclusive group of individuals. Those elected to public office have a passion to lead and to serve, despite all the negativity that surrounds the process. The mudslinging and name calling start simultaneously with the beginning of the campaign. If you are lucky enough to win, half of your constituents will dislike you from day one. Sounds like a pleasant career choice to me. The incredible amount of money spent on elections. I recently read that the winner of the 2016 Presidential election will likely spend over $1 billion to get elected and that all of the candidates will have spent an estimated $5 billion. That is a staggering amount of money for a single election. The candidates promoting their platform and policies with a straight face. Politicians offer solutions to all of our problems knowing full well that they will fall far short of the mark. I particularly enjoy the candidates promising to abolish the IRS or implementing a flat tax system with returns filed on a postcard. Not because I dislike my job, but because I know that this kind of reform will not happen anytime soon. Regardless of party affiliation, I truly appreciate those who step up and hold a public office. As dysfunctional as our governing bodies may seem, we still have life pretty good here in America. I predict that most employees at McGowen, Hurst, Clark & Smith will be millionaires at some point in the future. Accountants don’t earn any more income than other white-collar, middle class professionals, although we do hang right in there with health care providers, legal, and insurance professionals. This prediction is simply because most of our employees think like Accountants. Accountants are disciplined enough to understand the true benefits of delayed gratification. They are willing to forego spending on current purchases in order to add funds to their investment accounts, or delay taking on additional debt in order to buy something now. Accountants are not big on “Conspicuous Consumption.” There are a lot of nice, comfortable cars in our parking lot – but not very many “luxury” class vehicles. Many of us have read that Albert Einstein once remarked that the most powerful force in the universe is compound interest. Accountants get how that really works. MHC&S sponsors a 401(k) Plan for our employees. We have virtually 100% participation in the employee deferral portion of the Plan, including recent college graduates just starting out. The Firm provides a matching contribution to the Plan on the first 6% of each employee’s contribution. The average deferral rate last year for employees other than shareholders was about 8.75% – well beyond the minimum level necessary to earn the match. Accountants understand that saving a little extra now has the potential to snowball significantly in the future. Accountants aren’t big risk-takers. But they do know which risks to fear, and which to manage. One of the biggest risks we all face is future inflation. In response, Accountants direct their 401(k) assets into equity investments that provide opportunities for growth and a hedge against inflation. Accountants are also good at diversifying their assets among multiple classes including large-cap, mid-cap, small-cap, domestic and international funds. None of that “All your eggs in one basket” for Accountants. Accountants build wealth in lots of little steps. They take full advantage of employee benefit plans that provide dependent care reimbursements or pretax medical spending accounts. They contribute to Iowa’s 529 College Savings Plan in order to save for future college costs for their children. They keep good records in order avoid paying any more taxes than legally required. They work to eliminate bad debt such as credit cards, and carefully manage good debt such as home equity loans. Do you want to be a millionaire in the future? I suggest you start thinking like an Accountant! Gratitude – Can It Change Your Life? Since we are getting close to Thanksgiving, my thoughts turned to gratitude and what a role it plays in my life as it does for all of us. It reminded me of a challenge I was given about a year ago. A friend challenged me to write down 3 things that I was thankful for each day. She had started this a few days before me and felt it was truly changing her life. The rules were that I was to make my list first thing in the morning and that I couldn’t repeat any of the items I had already written down on a previous day. I was to continue this process for 60 days. As you can imagine, this was an easy task, at least, at first. But after the first 3 weeks, it involved a bit more of a search for me. I had to really stop and think about what I am thankful for and remind myself of the many things I take for grateful as well as the less obvious things. I recently ran across that list and was once again reminded of how much I have to be thankful for. For one thing, my sense of humor as I read some of my less thoughtful and more shallow ideas such as days when I don’t have to wear makeup or when they have my favorite soup at one of our restaurants! #1 WOW, do I have a lot to be grateful for! It is truly amazing what a wonderful and blessed life I have. It is so easy to say that I am thankful for my family, my wonderful career and work family, my marriage, my health, but it is much more fulfilling and meaningful when you are grateful each day and really think about what that means. For instance, when was the last time you were grateful for clean water, air or even having enough food to eat? These are just the basics of life, but there are still many in the world who don’t even have the basics. #2 When I start my day by writing down what I am grateful for, my attitude for the whole day is much more positive, and I feel better armed to take on the challenges of the day. Research has found that people who practice being grateful on a daily basis are 25% happier, have more energy, and handle depression and stress better. 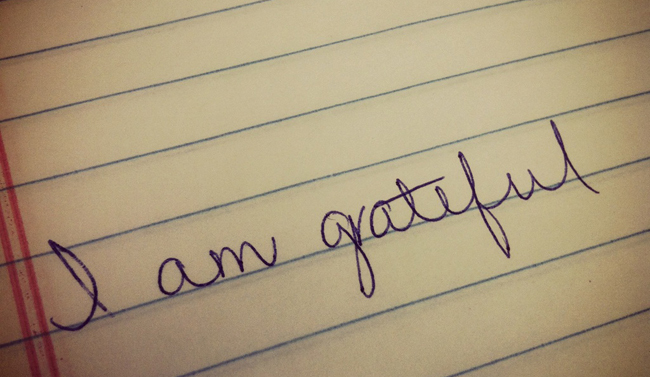 #3 By doing this exercise, it makes being grateful one of your daily habits. I am certainly not a master of gratitude, but I do start my day by being thankful! So I challenge you to give this project a try. I guarantee it will open your eyes …………..and your heart! You are currently viewing the archives for November, 2015 at McGowen, Hurst, Clark & Smith.